Chop up the haddock fillets and season with pepper, then drizzle with half of lemon juice. Set aside. Add a little oil to the pan and add the onions, cook until they are soft. Add the garlic and cook for 1-2 minutes. Add the courgette and chorizo and cook for about 2-3 minutes. Add the paprika and tomato puree then give it a good stir so everything in your pan is covered. Add the tinned tomatoes and stir. Add the saffron to your fish stock and give a good stir so the saffron can infuse the stock. Then add to the pan and bring to the boil. Turn down the heat and add your baby tomatoes, then cover and simmer for 20 minutes. Add your tinned chickpeas and stir in to the casserole. Heat through for about 4 minutes. While your casserole is simmering prepare your couscous to the instructions on the packet. Once it is ready grate half a lemon's zest and squeeze juice along with a handful of fresh parsley. Give it a good stir. Add your haddock and prawns to the pan and cover thoroughly in the sauce. They should cook though in a few minutes, keep an eye on them as you don't want to overcook your fish. 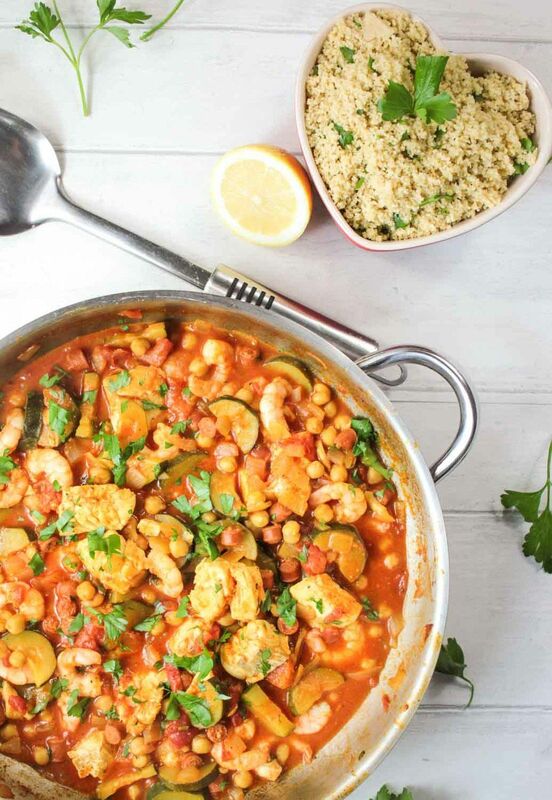 Sprinkle the casserole with fresh parsley, serve with couscous and enjoy!